Cantera Partners LLC (აშშ, ნებრასკა, ომაჰა) აცხადებს სატენდერო წინადადებების მიღებას 27,000 მეტრული ტონა (+/- 5%) აშშ-ის მაგარი წითელი ზამთრის ხორბლის რეალიზაციაზე. ხორბალი არის ამერიკული წარმოშობის და საქართველოში გამოიგზავნება ნაყარი სახის შეფუთვით. აშშ-ს ნებისმიერი პორტიდან ხორბლის ნაყარი ფორმით ხომალდით ერთჯერადად ტრანსპორტირება 2019 წლის აპრილისთვის იგეგმება (აშშ მთავრობის ქმედებებზე დაქვემდებარებით). ტვირთის ფოთის პორტის ნავსადგომში სავარაუდო ჩამოსვლა 2019 წლის მაისშია მოსალოდნელი. გადაზიდვა: ტვირთის საქართველოში შემოსვლა (გარანტიის გარეშე) 2019 წლის მაისში იგეგმება. ხორბლის დაახლოებით 27,000 მეტრული ტონა (+/- 5%) ხელმისაწვდომია შესასყიდად. ყველა დაინტერესებულმა პირმა უნდა წარმოადგინოს სატენდერო წინადადება აშშ დოლარში (USD) და ინკოტერმს CFR საქართველო, ფოთის პორტის ბაზაზე. გამარჯვებულმა პრეტენდენტ(ებ)მა კონტრაქტის ღირებულების 10%-ის გადახდა წინასწარ ნაღდი ანგარიშსწორებით უნდა მოახდინოს და დარჩენილ 90%-ზე სრულად წარმოადგინოს გამყიდველისათვის მისაღები ბანკის მიერ ინგლისურ ენაზე გაცემული შეუქცევადი, დადასტურებული დოკუმენტური აკრედიტივი ტვირთის აშშ-ს პორტის დატოვებამდე. კონტრაქტის მინიჭების შემდეგ, პრეტენდენტი ვალდებულია დოკუმენტური აკრედიტივი ნასყიდობის ხელშეკრულების გაფორმებიდან 10 სამუშაო დღის ვადაში გახსნას. დოკუმენტური აკრედიტივის ყველა პირობა უნდა იყოს შეთანხმებული და მისაღები ორივე მხარის მიერ. მიუხედავად იმისა, რომ აკრედიტივის წარმოდგენა აუცილებელია, გამყიდველს შეუძლია განიხილოს მისი წამყვანი ქართული ან საერთაშორისო ბანკის მიერ გაცემული საბანკო გარანტიით ჩანაცვლება, იმ შემთხვევაში, თუ საფუძვლიანად დასაბუთდება აკრედიტივის გამოცემის არაპრაქტიკულობა. საქონლის რე-ექსპორტი საქართველოს ფარგლებს გარეთ აკრძალულია. ტენდერის მონაწილეებს განაცხადის წარდგენა შეუძლიათ მთლიან ან ნაწილობრივ შესყიდვაზე. შესყიდვის მინიმალური ლოტია 5,000 მეტრული ტონა. საწყისი წინადადება: საწყისი სატენდერო წინადადებები წარმოდგენილი უნდა იყოს აშშ დოლარში (USD) და ინკოტერმს CFR ფოთის პორტის ბაზაზე. სატენდერო წინადადებები წარმოდგენილი უნდა იყოს ამ განცხადების გამოქვეყნებიდან ათი დღის განმავლობაში. წინასწარი გადახდა: წარმატებული მყიდველი, რომელიც ხელს მოაწერს ნასყიდობის ხელშეკრულებას გამყიდველთან, ვალდებული იქნება ხელშეკრულების ღირებულების 10% გადაიხადოს ხელშეკრულების ხელმოწერის დღიდან 5 კალენდარული დღის განმავლობაში. ტვირთის გადაზიდვა: შემსრულებელი სატრანსპორტო გემი განისაზღვრება ამერიკის შეერთებული შტატების სოფლის მეურნეობის დეპარტამენტის (USDA) „სურსათი პროგრესისათვის“ პროგრამის სატვირთო სატენდერო პროცედურის სახელმძღვანელოს შესაბამისად. შემსრულებელი გემი შეიძლება იყოს: bulker, tween/multi-decker ან ocean-going tug barge. დაზღვევა და ტიტული: გამყიდველს ტვირთზე უფლება უნარჩუნდება მანამ, სანამ დოკუმენტური აკრედიტივის პირობების შესაბამისად გამყიდველი სრულად არ მიიღებს ტვირთის საფასურს. თუმცა, აღიარებულია და შეთანხმებულია, რომ ტვირთის დაკარგვის რისკი და სადაზღვევო ხარჯები გადადის შემსყიდველზე აშშ-ს პორტში საქონლის გემზე დატვირთვისთანავე. საზღვაო ან/და სახმელეთო ტრანპორტირებისას ტვირთის დაკარგვის ან დაზიანების დაზღვევის ნებისმიერი ხარჯი მყიდველის სრული პასუხისმგებლობაა. შემსყიდველი პასუხისმგებელია ტვირთის განბაჟებასთან დაკავშირებული კანონით გათვალისწინებული ნებისმიერი საბაჟო მოსაკრებლებისა და გადასახადების გადახდაზე. დამატებითი პირობები: შემსყიდველი თანხმდება, რომ შესყიდულ საქონელს საქართველოს ფარგლებს გარეთ რე-ექსპორტით არ გაყიდის. გთხოვთ, თქვენი საბოლოო სატენდერო წინადადებები გამოაგზავნოთ მაიკლ იუნგთან bid@canterapartners.com ელ-ფოსტის მეშვეობით ოთხშაბათს, 2019 წლის 20 მარტის დღის ბოლომდე. ყველა შემოსული სატენდერო წინადადება ძალაში უნდა იყოს ტენდერის დამთავრებიდან 21 დღის განმავლობაში. • ტენდერის მონაწილემ საქონლის შესასყიდი რაოდენობა უნდა განსაზღვროს მეტრულ ტონებში. • ტენდერის მონაწილე ვალდებულია წარადგინოს ორი ბანკის რეკომენდაცია და საკონტაქტო ინფორმაცია, რომელიც ადასტურებს ამ განცხადებაში ჩამოთვლილი პირობების შესაბამისად მის მიერ დოკუმენტური აკრედიტივის გახსნის შესაძლებლობას. • ტენდერის მონაწილემ ასევე უნდა წარმოადგინოს საქონლის (სასოფლო ან არასასოფლო) ნაყარი ფორმით საქართველოში იმპორტირების გამოცდილების მოკლე აღწერა. თუ პრეტენდენტს აშშ-ის მთავრობის რომელიმე პროგრამის ფარგლებში პროდუქციის შემოტანის გამოცდილება აქვს, აუცილებლად ახსენეთ დეტალები. • ტენდერის მონაწილემ ასევე უნდა წარმოადგინოს კომპანიის საქმიანობის მოკლე აღწერილობა და მიუთითოს საქართველოს ბაზარზე ოპერირების ხანგრძლივობა. ზემოთ აღნიშნული სატენდერო პირობების შეუსრულებლობის შემთხვევაში წარმატებული პრეტენდენტის წინადადება უარყოფილი იქნება. • გასცეს სატენდერო წინადადებების ახალი მოწვევა, რომელიც შეიძლება იყოს ან არ იყოს იგივე პირობებით. სატენდერო პროცესის პირობების ან შესყიდვის შესახებ ნებისმიერი კითხვით შეგიძლიათ მიმართოთ მაიკლ იუნგს მხოლოდ ელ. ფოსტის მეშვეობით. კანტერა პარტნიორების შესახებ ინფორმაცია შეგიძლიათ იხილოთ www.canterapartners.com ვებგვერდზე. ნასყიდობის ხელშეკრულების ნიმუში იხილეთ http://canterapartners.com/wheat/ ბმულზე. Cantera Partners LLC, Omaha, Nebraska, USA, requests bids for the purchase of 27,000 metric tons (+/- 5%) of U.S. HRW wheat. The wheat is of U.S. origin and will be shipped in bulk. The expected shipment period of this wheat from any U.S. port is April 2019 (subject to U.S. government action) in one bulk shipments/vessels. The estimated arrival at the Port of Poti, Georgia is May 2019. Shipment: The shipment is estimated to arrive in Georgia, without guarantee, in May 2019; approximately 27,000 metric tons (+/- 5%) of wheat is available for sale for which all interested parties should submit their bids in U.S. Dollars ($) and Incoterms CFR (C&F free out) port of Poti, Georgia basis. The highest bidder(s) will have to pay 10% of the contract value in cash and need to provide an irrevocable, confirmed letter of credit for 90% of the contract value, payable at sight and issued in English by a bank acceptable to the seller for the full amount prior to shipment from the US Port of origin. Upon being awarded the contract, the bidder will need to open the letter of credit within ten business days after entering into a purchase agreement. The letter of credit terms must be mutually agreed upon by both parties. 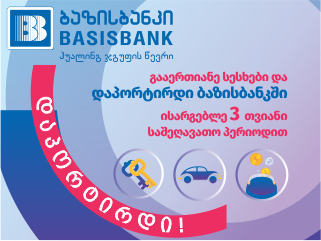 While a letter of credit is preferred, the seller may consider a bank guarantee by a leading Georgian or international bank if an L/C proves impractical. Re-exporting of the commodity outside of Georgia is prohibited. Bidders can submit bids on the whole or partial allotments. The minimum bid allotment is 5,000 metric tons. Initial Bid: Bids should be submitted in U.S. Dollars ($) and Incoterms CFR (C&F free out) port of Poti basis. Bids should be submitted within ten days of this announcement’s publication. Down payment: A successful buyer who signs a sales /purchase contract with seller will be required to pay a down payment that will equal 10% of the total contract value within 5 calendar days from signing the sales/purchase contract. Freight: Performing vessel will be determined by a freight tender procedure in accordance with the United States Department of Agriculture (USDA) Food for Progress guidelines. The performing vessel will be a bulker, tween/multi-decker or ocean-going tug barge. Insurance and Title: Seller shall retain title to the commodities until seller has been paid in full in accordance to the terms of the letter of credit. However, it is acknowledged and agreed that risk of loss and insurance costs shall pass to bidder when commodities are delivered on board the vessel at the U.S. port. Any marine and overland insurance to cover specified loss or damage during the ocean voyage and inland transport of the commodities shall be at bidder’s sole responsibility and cost. Bidder shall be responsible for clearing customs and paying all customs fees, duties, and taxes with respect to the importation of the commodities.Additional Terms: The Buyer agrees not to re-export the commodities outside of Georgia.Please submit your final bids by email to Michael Jung (bid@canterapartners.com) by Wednesday March 20, 2019. All bids must remain valid for 21 days. Bidders are required to submit two bank references and contact information confirming the bidder’s capability of opening a letter of credit according to the terms listed in this announcement. Bidder must also supply a summary of the bidder’s previous direct experience in importing bulk commodities into Georgia being either agricultural or non-agriculture. Please specify if the bidder has experience importing through U.S. Government programs. Bidder must also supply a brief background on the bidder’s company and number of years the company has been in business. reject any or all the bids and issue a new invitation for bids. issue a new invitation for bids, which may or may not be the same as this invitation.